The Fifty Factor: Is It Loud In Here Or Am I Just Old? Imagine a cross between a jack hammer in Time Square and a sold out heavy metal concert at Madison Square Garden. Painfully loud, right? Well, that's how loud it was in the restaurant we dined in tonight. Deafening is the only way to describe it. We pulled up to the curbside Valet and thought there must be some kind of ruckus nearby. There wasn't. The loud chaos was coming from inside the restaurant-- The restaurant behind closed doors. Six of us gathered at a new "in" spot for gourmet pizza and fancy salads. We'd read about it in a local magazine and decided to give it a try. The review raved about the food, the service and the decor; and they were right. It was all great. But nowhere in the article did they mention a single word about the ungodly noise level. I've heard the saying "If it's too loud, You're too old." and well, dang, I guess that makes all six of use total geezers. It was so loud we skipped coffee and practically ran out of the place for peace and quiet. Our ears and heads hurt from yelling over the blaring music as it bounced off the cement walls and floor! I can't remember the last time I ate in an upscale restaurant that you could carry on an actual conversation with the person sitting next to you, let alone across the table. Is that too much to ask? Imagine how nice a meal would be if you weren't saying "What?, Huh?, Say that again?" all night long. My question is WHY? What is the point of restaurants where you have to yell directly into the waiter's ear to place your order-- Then repeat your order multiple times because even he-- the much younger person-- can't hear you! I don't get it, and I think I'm not the only one. I swear, if I opened a restaurant in Los Angeles called Shhhhhh, it would be packed every night with happy people, talking at a reasonable level, without music blaring, who were enjoying their meals. Most people would friggin love it whether they're "old" like me, on a romantic date, or just hanging out with friends of any age! 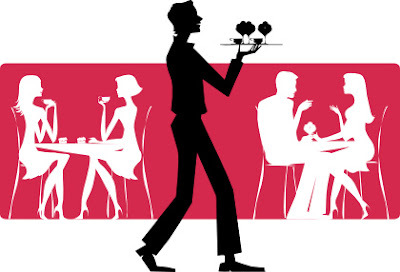 Diners could actually talk to each other without sign language, lip reading or texting each other. Someday, maybe restaurateurs will get it and turn down the music, lay some carpet and add noise panels..... You now, for us old folks. How's the noise working for you? As I get older I tend to listen to my own kind of music at a loud level but the annoying music is always too loud as far as I'm concerned. That would be a fantastic restaurant name. At least the food & wine were good. My ex used to have restaurants in the UK so I know what you mean. The reason the music is so loud is because all the staff are so young. They are used to doing lots of things in such noisy environments. I was always turning it down. Then you would get customers requesting it be louder. Ughhhh. I cannot stand it either - mood music means background noise, then again I am an old codger too it seems! Great post. When I go out to dinner I definitely steer clear of "loud" restaurants. I want to enjoy the food and the conversation. If I want to dance and listen to music I go to a nightclub. Great name for a restaurant "Shhhhhh". I think you should patent that name. I enjoyed dropping by and reading some of your posts.